We’d love your help. Let us know what’s wrong with this preview of The Enneagram by Richard Rohr. To ask other readers questions about The Enneagram, please sign up. In this book Richard Rohr and Andreas Ebert explain the enneagram, an ancient personality test used first by Christian ascetics and monks and later by Muslim sufis. It divides people into nine personality types which can be described by their primary need ("need to be perfect", "need to succeed", etc. ), their primary sin ("pride", "anger", etc. ), or other features. These nine types are arranged in a continuum around a circle, with lines connecting them indicating various relationships to each ot In this book Richard Rohr and Andreas Ebert explain the enneagram, an ancient personality test used first by Christian ascetics and monks and later by Muslim sufis. It divides people into nine personality types which can be described by their primary need ("need to be perfect", "need to succeed", etc. ), their primary sin ("pride", "anger", etc. ), or other features. These nine types are arranged in a continuum around a circle, with lines connecting them indicating various relationships to each other. The authors give a Christian perspective on the enneagram, meaning that they attempt to show Christians how this can be a very effective tool for personal spiritual growth (which they do very well) and how it is connected to Christian scripture (which they don't do so well). In the end I found the book incredibly helpful. I read it hoping to gain some new ground in dealing with my own brokenness and kindle new growth as a person, and I was not at all disappointed. Seriously, this has been sooo useful, and even 6 weeks after finishing it I find myself thinking about it frequently. It is worth pointing out that the authors recommend not reading the book or making use of the enneagram until one is at least in their 30s--old enough to have realized that our youthful attempts to do away with our flaws through self-improvement aren't going to work. As they see it (and I think I agree) the enneagram is for people who are ready to acknowledge their complete brokenness and throw themselves on the mercy of God. This book is not without flaws. Before the nine types are described there are a few different chapters/essays, some of which are a bit dull and not as helpful as others--I definitely skimmed some. Also, people who place a big emphasis on the Bible as the word of God will likely be bothered by how the authors interact with the text in places. Finally, the enneagram itself comes out of an ancient worldview that at times left me feeling a bit skeptical--there is definitely a mystical view of numbers and geometry, and more than once I found myself wondering how seriously I ought to entertain all the concepts. But again, the overall approach more than made up for the eyebrow-raising aspects. I'm relieved to know that your Enneagram type is supposed to be humiliating because it is. My favorite quote from this book didn't come from the author but Thomas Merton: "The great tragedy of our age is the fact...that there are so many godless Christians--Christians, that is, whose religion is a matter of pure conformism and expedience. Their 'faith' is little more than a permanent evasion of reality--a compromise with life. In order to avoid admitting the uncomfortable truth that they no longe I'm relieved to know that your Enneagram type is supposed to be humiliating because it is. My favorite quote from this book didn't come from the author but Thomas Merton: "The great tragedy of our age is the fact...that there are so many godless Christians--Christians, that is, whose religion is a matter of pure conformism and expedience. Their 'faith' is little more than a permanent evasion of reality--a compromise with life. In order to avoid admitting the uncomfortable truth that they no longer have any real need for God or any vital faith in Him, they conform to the outward conduct of others like themselves. And these 'believers' cling together, offering one another an apparent justification for lives that are essential the same as the lives of their materialistic neighbors, who horizons are purely those of the world and its transient values." The Ennegram attempts to help you identify the root of your sin as well as your area of greatest need to grow so that you might be able to live against your nature and be transformed--all within the scope of God's grace, of course. I was skeptical about this book for two reason. When something is trendy, like the Enneagram, I hate it by default. (The first version of this book, to be fair, was from the 1980s.) I’ve also done a lot of introspective exercises in the last few years, and at this point I’m a bit skeptical of more of it.The reason is, at some point I think you have to focus less on yourself and more on the rest of the cosmos. I was mentally primed to not finish this book. About halfway through, though, it was ob I was skeptical about this book for two reason. When something is trendy, like the Enneagram, I hate it by default. (The first version of this book, to be fair, was from the 1980s.) I’ve also done a lot of introspective exercises in the last few years, and at this point I’m a bit skeptical of more of it.The reason is, at some point I think you have to focus less on yourself and more on the rest of the cosmos. I was mentally primed to not finish this book. About halfway through, though, it was obvious this would be a five-star review. Like my other five-star reviewed books, this one changed me by making think about the world in a new way. If you haven’t heard of the Enneagram before, you can think of it as kind of an ancient Meyers Briggs Type Indicator, mixed with a little religious mysticism and Hippocrates’ four humors. The Enneagram is kind of like a clock face, only it contains nine numbers instead of 12 numbers. There are nine related Enneagram personality types, and each type provides insight on a different flavor of person. Each flavor has its own strengths, weaknesses, and motivations. While these kinds of tests are systems aren’t new, the authors trace the Enneagram (in various forms), back to Sufi, Christian, and Kabbalah roots. If things ended there, this book would be less interesting. What is most useful in the Enneagram is the connection between the types (see the cover for an idea of the connections). Understanding the connections helps you understand how you can grow as a person for the better and flourish. It can also help you better understand your spouse, your friends, your parents, and your kids. Another benefit of the book is that the authors break down each type by characteristics, motivation, Biblical examples (the authors are Franciscan and Lutheran), Scripture, symbolic animal/color/country, and more. As mentioned above, the book helps you understanding the healthy and unhealthy versions of each type. It uses the more “churchy” terms of “unredeemed” and “transformed”. The historical information was interesting. There was definitely information that I hadn’t heard yet, as well as some that was review. I still don’t think I fully grasp the whole concept of the false and true selves. But I had to breeze through a lot of it because it was due back for someone else’s hold. Need to check it out again when I have more time to give to reading and thinking! Over dinner one night my friend said, "I'm an Enneagram Type Six, what are you?" From online Enneagram test results, I knew I was a Type One. She went on to talk about the freedom and healing she'd found in knowing her type and what she needed to work on to become a mature and balanced Type Six. That information I didn't find online, but in this book by Richard Rohr and Andreas Ebert. Unlike the familiar Myers-Briggs personality grid, the Enneagram is a cryptic, almost mystical, circle with nine Over dinner one night my friend said, "I'm an Enneagram Type Six, what are you?" From online Enneagram test results, I knew I was a Type One. She went on to talk about the freedom and healing she'd found in knowing her type and what she needed to work on to become a mature and balanced Type Six. That information I didn't find online, but in this book by Richard Rohr and Andreas Ebert. Unlike the familiar Myers-Briggs personality grid, the Enneagram is a cryptic, almost mystical, circle with nine numbered points along the circumference and lines connecting some numbers to others. Each individual strongly identifies with one Type, but there are many variations within a type. Each type also has wings, subtypes, a besetting sin, and directional arrows toward other types that lead to growth or regression. 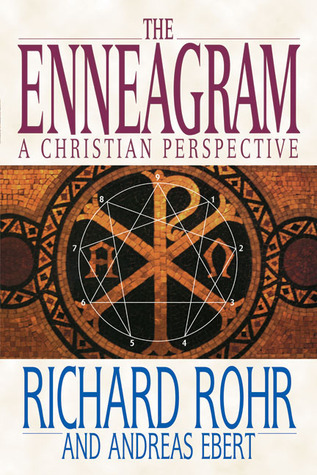 Rohr eases the reader into the Enneagram's descriptions for each Type and reserves the additional complexities for the latter chapters. He begins by focusing on the besetting, often unacknowledged, sin for each type that keeps us from growing and finding the true self God created us to be. Type Ones struggle with Anger, Twos with Pride, Fives with Avarice, Sevens with Envy, etc. Rohr describes the offsetting fruit of the spirit for each sin, the defense mechanisms that hinder maturity, and the emotional pitfalls for all nine types. The authors share personal experiences, and examples from Scripture and church history that put flesh on each type's description. Rather than a "this is what I am" kind-of awareness, the Enneagram leads to movement and transformation. Rather than feeling constrained by a four-letter mold, the challenge to readers is to broaden themselves, see their compulsions and habits redeemed, and encounter God (256-257). Typology always frustrates me as I always feel I don't quite fit anywhere. The thing I liked about this book is that it used the types to attack and expose your sinful tendencies and power-dangers. Of course, those are also your great strengths, but it was not slow in putting them in their place and acknowledging the ways we weild our strengths to trouble the world (rather than better it). I started and finished this book in one day plagued with intrigue and deep, vulnerable sadness. The insights are spectacular, deafening, and at times led me to tears of joy and pain which I found beautiful...which I guess is because I'm a 4. If this book was a marathon, most of what I’ve read on the enneagram thus far has been comparable to anything from a 5k to a Half Marathon. I’m grateful for the work, the research, the perspective offered in it — but man, my eyes went a little blurry sometimes from the headiness of it, which meant I had to take small bites over time. But that’s okay! It is definitely one I will refer to again and again on the long and windy road of transformation! This book was essentially my first exposure to the Enneagram, and it was a solid one. I found Rohr and Ebert's overview both comprehensive and detailed enough to be useful in exploring my own type. I would say the book was most useful to me as an overview of the Enneagram as a whole, its purpose and practice. Great deep dive into the Enneagram. I learned so much about the history of this spiritual personality typing system. Written somewhat academically, I had to read sections over just to grasp the concepts sometimes. Life changing. I'm glad I dove into this world and look forward to understanding more of what it can teach me. One of the meatier books on the subject I've read. Rohr doesn't sugarcoat his take on the various numbers, but frankly and unusually discusses them from a place of intense study and vast experience. (His 4 is rather different from other 4 comparisons I've found!) He also tackles it from a Christian perspective, and includes Biblical examples and some of the saints, which is fun. Fascinating. Detailed. Great examples. I really enjoyed reading and learning more about all 9 types. Self-assessments are certainly popular. There are plenty of them that claim to give us insight regarding how we work and function. But how helpful are they really? Is the insight that is provided actually meaningful and helpful? In the case of the Enneagram, the answer is "absolutely." Although I didn't know much about the Enneagram before reading this book, apparently many Christians are freaked out by it. The Enneagram is built around the idea that there are basically nine shapes of the human Self-assessments are certainly popular. There are plenty of them that claim to give us insight regarding how we work and function. But how helpful are they really? Is the insight that is provided actually meaningful and helpful? In the case of the Enneagram, the answer is "absolutely." Although I didn't know much about the Enneagram before reading this book, apparently many Christians are freaked out by it. The Enneagram is built around the idea that there are basically nine shapes of the human soul. Each "soul type" (for lack of a better term) has unique strengths and desires which bring alongside with them a dark side. Rohr spends the first half of the book describing the origins of the Enneagram and how it has been used and abused historically. He discusses what the tool can accomplish and what it cannot accomplish. Overall, it seems there is great redemptive potential for this tool in the lives of Jesus-followers. There were a handful of spots in the book where I felt the author reached a little too far in his attempt to describe particular souls (e.g. reaching into an individual's physical appearance). But in general, each chapter was remarkably insightful. Of all that I've read regarding the Enneagram, this is the only work that focuses almost entirely on the redemptive application of the Enneagram. Rohr & Ebert understand that the Enneagram's usefulness is not in finding and operating out of your type. Rather, it is about understanding yourself and what freedom and Christ-likeness look like. The only drawback to this book is that some of the language is too nuanced to be widely applicable. If you identify with their language, you'll find it e Of all that I've read regarding the Enneagram, this is the only work that focuses almost entirely on the redemptive application of the Enneagram. Rohr & Ebert understand that the Enneagram's usefulness is not in finding and operating out of your type. Rather, it is about understanding yourself and what freedom and Christ-likeness look like. The only drawback to this book is that some of the language is too nuanced to be widely applicable. If you identify with their language, you'll find it extremely helpful. But if you don't really agree with their animals and countries that they relate to each type, it might be a drawback. Other sources of information regarding the Enneagram systematize the language a little more and brush with broader strokes. This isn't enough to drop my review of this book, it's simply something to recognize. I have looked into different ways of categorizing personalities many times, but this was the first time I was confronted with something both insightful and capable of dealing with real complexity. Identifying personality types by means of the ways we cope with the world is brilliant, and sets inner struggles in a whole new light. Not only was this helpful to me as a person (and it was), it was also extremely helpful to me as a writer. Stories are about characters, and they operate on readers. A g I have looked into different ways of categorizing personalities many times, but this was the first time I was confronted with something both insightful and capable of dealing with real complexity. Identifying personality types by means of the ways we cope with the world is brilliant, and sets inner struggles in a whole new light. Not only was this helpful to me as a person (and it was), it was also extremely helpful to me as a writer. Stories are about characters, and they operate on readers. A good understanding of the way people work and the way they change and mature and deal with life impacts both how your characters work and what stories you think need to be told. For some reason this personality typing made so much more sense and was so much more helpful than Myers-Briggs or disc. I started with The Enneagram Made Easy and then went to this book for a more detailed look. I like the Enneagram because it details your strengths and weaknesses and gives advice on how to become a better person. I think I am a 3 and now have new things to work on. It's very eye-opening and I plan on referencing it a lot! I found this very helpful for an in-depth study of the enneagram. It is long and dense at times, however. I would recommend it if you are interested in a combination of Christianity, it's history and the enneagram. It can read like a text book at times. If you are completely new to the enneagram, you may want to read up on the enneagram through other sources before reading this. So interesting! I understand a lot of things in my life in relation to the ideas in this book now. Not the best book to read if you're looking for a self esteem pick-me-up, but great if you're looking for insight as to how you function and process the world in real terms - the good, bad, and ugly. While I found the beginning rather dry, once o got into it, I couldn't put it down. Please do yourself a favor and get to know yourself by figuring out which enneagram type you are. The most important things to mention are that the Enneagram is a personality model and that it is unique among such models in that it highlights the “pitfalls” or “root sin” of each personality type. In doing so, the purpose of the Enneagram is to provide us a means for confronting our primary behavior of self-defense and thus to help us convert our most paralyzing instinct into our greatest gift. Put another way, the Enneagram identifies our “false self” and points us toward our “true self.” Th The most important things to mention are that the Enneagram is a personality model and that it is unique among such models in that it highlights the “pitfalls” or “root sin” of each personality type. In doing so, the purpose of the Enneagram is to provide us a means for confronting our primary behavior of self-defense and thus to help us convert our most paralyzing instinct into our greatest gift. Put another way, the Enneagram identifies our “false self” and points us toward our “true self.” Thus we embark on a process of moving from "immature" to "mature" within our unique personality, and the goal of this journey is the growth of our spiritual and psychological health. The section that describes each of the personality types in detail is excellent, whether one has previous experience with the Enneagram or not. This is followed by the final section of the book, which explains the complexity of the Enneagram in more depth and focuses on the angles that best prepare us for the journey from "immature" to "mature." While I found this section equally useful, I do retain some skepticism for the depth with which the Enneagram has been analyzed and applied. The analysis of the visual icon of the Enneagram (a circle whose circumference contains the nine personality types and a series of lines within the circle connecting some types to others) is logical, but the authors’ confident explanations of the various nuances and movements of each personality type didn’t fully transfer to me. The best comparison I can think of is reading one’s horoscope, though this comparison is unfair because the Enneagram is much more personally relatable. Nonetheless, because the Enneagram is a “fluid” system, even in its specificity it is susceptible to some generalizing. I have doubts that this commentary makes sense to those unfamiliar with the Enneagram, and I’ve only touched on a part of the depth the authors discuss: there are also “subtypes” for each personality as well as “points of consolation,” “pitfalls,” “avoidances,” “self-identities,” “fruits of the spirit,” “defense mechanisms,” and “immature,” “stagnant/normal,” and “mature” stages of development for each type. It is all quite fascinating. And whatever level of “buying in” a person is willing to do, I believe it is all quite helpful as well. More than any other personality model, I find myself identifying strongly with the challenges of my type as well as with the described path toward greater psychological and spiritual health. As with so many things, awareness is the first step to improvement and change, and Rohr’s and Ebert’s book does much to prompt awareness. And as with all personality models, the Enneagram does not come without the temptation to put ourselves and others into a box, but this is not its purpose. In fact, its purpose is nearly the opposite: to help us break out of a box within which we may or may not be aware we are confined. The Enneagram is not a pat-on-the-back like a horoscope or a fortune cookie, but it does direct light toward each person’s truly awesome potential. I first heard of the enneagram when I read Anne Bogel's book, Reading People, back in January. My first reaction was, "Well, that's negative!" I also thought the diagram used to illustrate the enneagram looked really new-agey. At the same time, it intrigued me and I started doing some more research on it. I found it that it was used by monks as a means of facing their sin and finding a greater closeness with God. Now it is used in counseling as well as in retreats and exercises of contemplation. I first heard of the enneagram when I read Anne Bogel's book, Reading People, back in January. My first reaction was, "Well, that's negative!" I also thought the diagram used to illustrate the enneagram looked really new-agey. At the same time, it intrigued me and I started doing some more research on it. I found it that it was used by monks as a means of facing their sin and finding a greater closeness with God. Now it is used in counseling as well as in retreats and exercises of contemplation. Unlike most personality typings that focus on your strengths, the enneagram focuses on your besetting sin (anger, pride, untruth, envy, avarice, fear, intemperance, shamelessness, and laziness) and your most basic need (to be perfect, to be needed, to succeed, to be special, to perceive, for security, to avoid pain, to be against, and to avoid). While we all commit those sins at one time or another, we have a greater tendency towards certain sins than others. The enneagram forces you to take a close look at your besetting sin and discover how that can be redeemed and overcome to move you to a place of greater balance. It reveals how we hide from ourselves and from God. Understanding the enneagram allows us to face our sin. The enneagram is actually quite complicated and I don't full understand it yet. But I can see how through parental influence, prayer, responding to the Holy Spirit's conviction, and by a lot of hard work, one moves from their weakest to take on the characteristics from one of the types across the circle. This isn't just random, but there is actually a type that balances your type and another one that you revert to when you're not you're at your best (during stress, etc). You also have a "wing" which means that you aren't likely 100% of a type. As we take on characteristics from another type, we become more balanced and learn to use the flip side of our weaknesses as strengths. For example, I am a 9 on the enneagram, which means my sin is laziness and I feel the need to avoid unpleasantness. The 3, though is an extremely hard worker who needs to succeed and so as I become more balanced, I take on some of the characteristics of a 3 and am able to work hard and say no when needed. As I become a more balanced 9, I can be used to speak peace and calmness into a situation. That's a super brief explanation as I am still figuring out how the enneagram works. I read several other books on the Enneagram and found this to be the best, especially if you want a Christian perspective on it. But even without that, I found the descriptions of the 9 personality types to be clearest and I was able to find myself pretty easily, even though I have characteristics in others of the personality types. I love the constructive emphasis in this book that your strength is your weakness and it allows you to understand both yourself and others much better. It helped me I read several other books on the Enneagram and found this to be the best, especially if you want a Christian perspective on it. But even without that, I found the descriptions of the 9 personality types to be clearest and I was able to find myself pretty easily, even though I have characteristics in others of the personality types. I love the constructive emphasis in this book that your strength is your weakness and it allows you to understand both yourself and others much better. It helped me to understand part of why I am why I am and to accept it that way and not try to change it because others are not like that. There were a few places where some of those little things were a revelation, and now they all seem to fit into a better whole. Of course there aren't just 9 types of people in the world and each characteristic of a type doesn't describe each person, but it is a broad brush. This book did the best job I have seen of showing the nuances of variations on the themes and movement toward other types that is part of the process of personal growth.